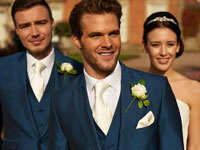 Calling all grooms! Whether you're seeking a stylish look for your wedding or tips for public speaking, this is your one-stop for your planning. From classic formal wear to contemporary suits and colourful tartans, our range of grooms wear specialists in Devon and Cornwall will guarantee a suave wedding day ensemble. 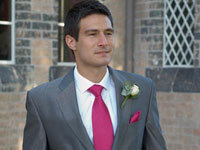 Stocking a large and lavish rage of gorgeous grooms wear, The Wedding Company is awash with top notch style for the modern man. Home to the renowned Peter Posh label, the Plympton boutique offers everything from waistcoats, ties and neckwear to shirts, shoes, and dinner and evening wear - including single and double breasted DJs. Whether you're seeking something traditional and timeless or with a contemporary design, their fabulous variety of styles will suit all types of groom to truly head-turning effect. Cornovi are specialists in Cornish kilt hire and retail sales; with Cornish National, Cornish Hunting and St Piran dress tartans all available to hire from in house stock. A range of Scottish, Irish and Welsh tartans can also be obtained for hiring. With a wealth of experience and knowledge of the kilt industry, Cornovi provides a professional service which means you can relax safe in the knowledge that you will look fabulous on your special day. Little Anne-Maids stocks a brilliant range of men's formal hire. Tailcoats are available in black, navy, green and grey and with 200 styles of waistcoat available to complement your outfit alongside a range of different neckwear in various colours, we believe we have a fabulous choice. Dinner jackets are available as single or double breasted and we also stock white tuxedos, evening tails and nouveau jackets in various colours. Highland wear is available in black, navy and green with a choice of 11 different tartans. Stocking labels such as Etiquette and Peter Posh, our full range of fine accessories are available to hire or purchase.